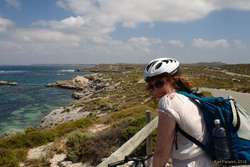 Riding bikes around Rottnest Island with a group of friends is a truly great way to spend a day. We rented bikes and snorkelling gear, took the earliest ferry over, and had a spectacular day. Great weather, not too hot. 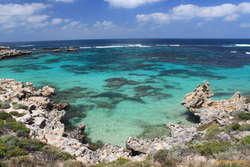 We snorkelled at Parker Point, which has a "self guided snorkel tour". This was.... interesting... It was high tide, or nearly so, so you had to swim rather than walk over to the start of the tour. We then spent a good while trying to find the tour. 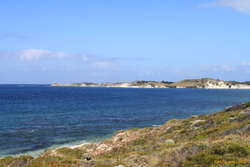 Allegedly, there are markers under water, and a route to follow, but we were struggling with seaweed and deep water. Eventually, with a bit of faith in the high tide, we went out further, and actually mananged to find one. They had floats attached, which were well under water, and the plaques were heavily overgrown with moss and coral and the detritus of the sea. They were also often a bit deeper than we felt comfortable with given the tide. A good idea, but something that needs maintennance. However, once we got out from the shore, we found that it stayed quite shallow and the seaweed gave way to coral and fish! It was a lovely snorkel in the end. 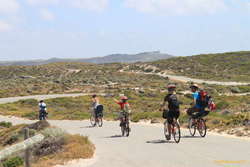 We headed onwards to the lighthouse, and then lunch at Green Island. We were all sitting on a bench of rock at the beach there, contentedly eating our lunch, when a short old asian man walked up to us from down the beach and started waving his arms and beckoning us to follow him. He was showing us a big lizard, that had apparently walked underneath the rock under all of us, and was then heading up when the old man spotted him. He was quite a sight, and we saw another by the toilets as we were leaving. 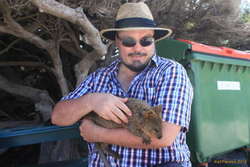 Lots of quokkas of course, all basically tame. As we rode around the far side of the island, the sun came out with a vengeance, and we started to regret not having more water. 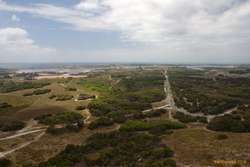 It became quite a ride, just more heat and more beaches. We pushed on, needing water, until we got back to Geordie bay to the shops there. A team of redfaced tourists all slurping down cold drinks for a few minutes. More water! We stopped for a second snorkel trip at The Basin, which was a lot more crowded, being only a 10-15 minute ride from the township at Thomson Bay, but this was a great place for snokelling. The tide had gone down a bit, and you didn't have to swim as far to get out to the fun stuff. Not as much coral as at Parker Point, but way more fish. You could just float in one shallow section and drift back and forth amidst big schools of fingerlings. Good fun. Then just back onto the ferry and home again. A truly excellent day out!